If you are visiting Barcelona with your family you have truly chosen a great destination. There are so many unique activities for children of all ages here, it is no wonder that it is such a popular city at our family hotel in Barcelona! 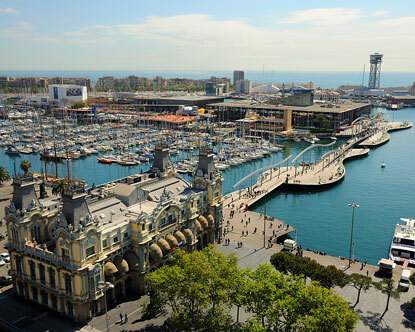 (Image courtesy of destination360 )A visit to Barcelona’s Port Vell for instance is a wonderful way to spend the day. Located at the end of La Rambla, and part of the Port of Barcelona, it is an interesting destination for families with several attractions to visit. Port Vell, which translates in Catalonian to Old Harbour, underwent an expansive upgrade for the 1992 Olympics and in 2014 the marina was extensively refurbished. Here you can visit the past at the Museu Marítim (Maritime Museum), or shop til you drop at Maremagnum Shopping Center, explore one of the largest aquariums in Europe at the Barcelona Aquarium, and afterwards watch the world go by at a cafe, to list just a few options at Port Vell. The Maritime Museum is a highly rated attraction which has models of Christopher Columbus’ three famous ships. There is also a full-size reconstruction of Juan de Austria, a 200-feet long galley that was propelled by 236 rowers. Interesting to note that the original was built onsite in 1568 when this area was a royal shipyard. The self guided tour of the Maritime Museum is very well organized with infrared pointers and headphones. In addition to the ships you can see figureheads, nautical gear, medieval nautical lore and much more here. The cafeteria is also worth a visit. If you need to shop then from La Rambla you would take the wooden bridge, called La Rambla del Mar, to Maremagnum Shopping Center, the only shopping center open on a Sunday in Barcelona. Here you will find chain stores to suit everybody’s tastes as well as outdoor dining with of course the great sea view. Finally the Barcelona Aquarium is a big hit with young and old alike. Here you will be mesmerized by underwater life of all types. There are 450 different species of aquatic life in 35 different aquariums, all of which are based on different themes. There is also an 80 meter underwater tunnel which is thought to be the longest in the world and is where you will find the sharks and manta rays at the aquarium. There is also the Planeta Aqua section of the aquarium, where the penguins are located. This is a place where one can learn about the importance of water to the planet and there is the Explora! Section, which is an educational, childs play area. A day at the Port will keep you busy! It is an easy walk to get to from most hotels and fun for all members of your family at our family hotel in Barcelona.